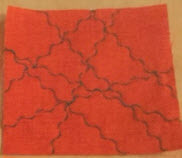 Do you want to experiment with the decorative stitches on your sewing machine? And practice them? If you do, this is the exchange for you. Each month you'll try out one new stitch, and at the end of June you'll have 36 basic colored blocks, all with different decorative stitches. ​At each meeting a group of four quilters will each bring four 6 1/2 inch blocks in the colour designated for that month to exchange with each other. Each block will be a solid or a blender fabric in the colour assigned that month. The block will simply be embellished with stitching of your choice from the extensive selection of decorative stitches our sewing machines have to offer. 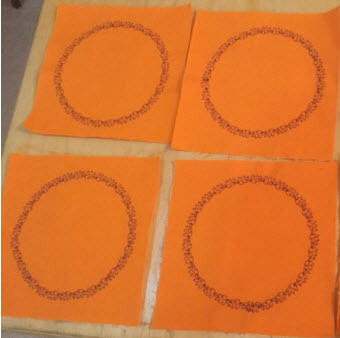 You may create any pattern that you would like to try. Make 4 blocks the same each month. If you miss a monthly meeting, bring those blocks the next month. 1. Thread choice can be anything: tonal, contrasting, variegated, matte, shiney etc. 2. Generous 6 1/2 inch block once stitched. 3. Stabilizer is a must...anything from basic photocopy paper to tearaway stabilizer can be used to keep the stitching from drawing the fabric in. 4. Stitching can be contained within the seam allowance or can run off the edges...however your creativity moves you that day. By June you will have a selection of 36 basic colour blocks that can be used for anything: a cushion, a bag, a runner or a baby quilt...whatever you envision.